In May 2010, Charles Djou won a surprise special election victory to become only the second Republican since statehood to represent Hawaii in the U.S. House of Representatives. Although his career on Capitol Hill lasted only a few months, Djou worked to control spending and lower taxes, and he was not afraid to break ties with his party on issues he felt strongly about. 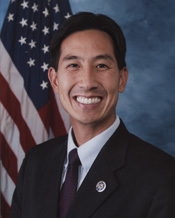 Charles J. Djou was born in Los Angeles, California, on August 9, 1970. Both of his parents had immigrated to the United States from across the Pacific. His father was born in Shanghai, China, and fled to Hong Kong during the Chinese Communist Revolution in the late 1940s. Djou’s mother grew up in Bangkok, Thailand.1 When he was a boy, Djou’s family moved to Hawaii and settled on the southeastern side of Oahu.2 He graduated in 1988 from the famed Punahou School in Honolulu and traveled east for college, earning both a bachelor of arts degree in political science and a bachelor of science degree in finance from the Wharton School of the University of Pennsylvania in 1992.3 Four years later he earned a law degree from the University of Southern California in Los Angeles. House Republicans assigned Djou to two popular and powerful committees, the Armed Services Committee and the Budget Committee.34 On the Armed Services Committee, a natural home for the Army reservist with a large military constituency, he served on two subcommittees, the Subcommittee on Readiness and the Subcommittee on Terrorism, Unconventional Threats and Capabilities. 1“Charles,” on Charles Djou’s official campaign website, accessed 10 August 2015, http://djou.com/about. 2Suzanne Roig, “5 Vie for East Oahu Council Seat,” 10 September 2002, Honolulu Advertiser: B3. 3“Charles Djou,” Biographical Directory of the United States Congress, 1774–Present, http://bioguide.congress.gov/scripts/biodisplay.pl?index=D000611; Charles Djou’s LinkedIn page, accessed 10 August 2015, https://www.linkedin.com/in/charles-djou-31305a29. 4“Charles,” on Charles Djou’s official campaign website, accessed 10 August 2015, http://djou.com/about. 5“Stacey,” on Charles Djou’s official campaign website, accessed 10 August 2015, http://djou.com/stacey. 6“Statewide Summary Report,” Office of Elections, State of Hawaii, 3 November 1998, http://elections.hawaii.gov/election-results/ (accessed 27 April 2016); “The 2002 Hawaii State Legislature,” 16 January 2002, Honolulu Advertiser: A12. 7Pat Omandam, “House Hammers Out Bill-Recall Agreement,” 21 February 2001, Honolulu Star-Bulletin: n.p. ; Pat Omandam, “Republicans Stop 4 House Bills,” 7 March 2001, Honolulu Star-Bulletin: n.p. ; “Djou Announces Council Run,” 25 February 2002, Honolulu Star-Bulletin: n.p. 8Pat Omandam, “Let the Sun Shine In, Say Republicans,” 17 March 2001, Honolulu Star-Bulletin: n.p. See also Richard Borreca, “Open State Budget Details to Public, Legislator Urges,” 2 April 2001, Honolulu Star-Bulletin: n.p. ; Richard Borreca, “Budget Papers Now Open to Public,” 7 April 2001, Honolulu Star-Bulletin: n.p. 9Lynda Arakawa, “House in Squabble Over Republican’s Double Duty,” 20 January 2002, Honolulu Advertiser: A29. See also Pat Omandam, “Djou’s Dual House Roles Spark Bitter Political Debate,” 19 January 2002, Honolulu Star-Bulletin: n.p. ; Pat Omandam, “Bill Would Move Up Primary Election,” 26 January 2002, Honolulu Star-Bulletin: n.p. ; Walter Wright, “Legislator to Run for Council,” 25 February 2002, Honolulu Advertiser: B3. 10“Djou Announces Council Run,” 25 February 2002, Honolulu Star-Bulletin: n.p. 14Treena Shapiro, “Election 2002,” 20 October 2002, Honolulu Advertiser: A27. 15Treena Shapiro, “Election 2002,” 6 November 2002, Honolulu Advertiser: A5. 16Robbie Dingeman, “Council Weighing Property Tax Hike,” 25 January 2003, Honolulu Advertiser: B1; “The Hot Seat,” 27 September 2009, Honolulu Advertiser: B1; “Djou Seeks Backing for Spending Caps,” 23 December 2003, Honolulu Advertiser: B6; Robbie Dingeman, “Djou Seeks Earlier Start for Curbside Recycling,” 12 March 2006, Honolulu Advertiser: A34; Johnny Brannon, “Recycling Takes New Turn,” 6 September 2007, Honolulu Advertiser: B1; B. J. Reyes, “Councilmen Find Allies to Fight Recycling Cut,” 20 May 2009, Honolulu Star-Bulletin: n.p. 17Sean Hao, “Council Votes 9-0 to Put Rail on Ballot,” 24 July 2008, Honolulu Advertiser: A1. 18Shira Toeplitz, “GOP Says Aloha to 2010 Special Election,” 15 December 2009, Roll Call: n.p. 19Shira Toeplitz, “The Farm Team: Hawaii,” 5 February 2008, Roll Call: n.p. ; “Hawaii: City Councilman Eyes Abercrombie Seat in ’10,” 16 October 2008, Roll Call: n.p. ; Shira Toeplitz, “Winds of Change Could Be Blowin’,” 20 January 2009, Roll Call: n.p. ; Chad Blair, “Charles Djou Running for Congress,” 19 March 2008, Pacific Business News: n.p. Djou also appeared to be keeping his options open. The Honolulu Star-Bulletin reported in November 2008 that Djou had also filed papers to seek the office of lieutenant governor during the 2010 election cycle. See Richard Borreca, “More Change to Occur in Next Election,” 9 November 2008, Honolulu Star-Bulletin: n.p. 20Richard Borreca, “Candidates Tossing Hat in Early, Too,” 12 December 2009, Honolulu Star-Bulletin: n.p. 21Aaron Blake, “NRCC Picks 13 Challengers with ‘Young Guns’ Potential,” 30 July 2009, The Hill: 4. Quotations from Richard Borreca, “Republican Attack Ads Target Abercrombie,” 21 February 2009, Honolulu Star-Bulletin: n.p. See also “Hawaii EMILY’s List Backs Hanabusa in 1st District,” 8 October 2009, Roll Call: n.p. 22Derrick DePledge, “Case Sets His Sights on Returning to Congress,” 29 March 2009, Honolulu Advertiser: A1. 23Office of the Clerk, U.S. House of Representatives, “Election Statistics, 1920 to Present,” http://history.house.gov/Institution/Election-Statistics/Election-Statistics/. 24Derrick DePledge, “Republicans Urged to Unite,” 17 May 2009, Honolulu Advertiser: A21. 25Jeremy B. White, “GOP Has Big Mauka to Climb in Hawaii,” 7 July 2009, Roll Call: n.p. ; B. J. Reyes, “2 TV Debates Might be the Key to Victory,” 2 May 2010, Honolulu Star-Bulletin: n.p. 26Derrick DePledge, “Local Democrats, Republicans Join Debate on Health Care Reform,” 21 August 2009, Honolulu Advertiser: n.p. ; Derrick DePledge “Health Care Fires Up Crowd,” 26 August 2009, Honolulu Advertiser: n.p. 27Richard Borreca, “Special Election Offers 3 Distinct Candidates,” 24 March 2010, Honolulu Star-Bulletin: n.p. 28David Shapiro, “Congressional Race Intriguing Contest,” 14 October 2009, Honolulu Advertiser: n.p. ; Shira Toeplitz, “GOP Says Aloha to 2010 Special Election,” 15 December 2009, Roll Call: n.p. 29Shira Toeplitz, “NRCC Weighs Playing in Pair of Specials,” 3 March 2010, Roll Call: n.p. 30Philip Rucker, “Republican Captures House Seat in Hawaii,” 24 May 2010, Washington Post: A2; “Djou Win Reflects Unrest of Voters,” 24 May 2010, Honolulu Star-Bulletin: n.p. 31Mark Sappenfield, “Charles Djou: How Did a Republican Win in Obama’s Hawaii Hometown?,” 23 May 2010, Christian Science Monitor: n.p. 32Craig Gima, “East Honolulu Went to Djou,” 24 May 2010, Honolulu Star-Bulletin: n.p. 33Congressional Record, House, 111th Cong., 2nd sess. (25 May 2010): 9269–9270. 34The House approved his assignments by way of H. Res. 1415, 111th Cong. (2010). 35Hearing before the House Committee on the Budget, State of the Economy: View from the Federal Reserve, 111th Cong., 2nd sess. (9 June 2010): 30–32. 36Hearing before the House Committee on the Budget, The American Recovery and Reinvestment Act of 2009, an Update, 111th Cong., 2nd sess. (14 July 2010): 31. 37Jan Austin, ed., “Key Votes: In the House,” CQ Almanac, 2010, 66th ed. (Washington, DC: CQ-Roll Call Group, 2011): Appendix C, 18–24; Mark Niesse, “Outside Image Coveted by Hawaii Congress Nominees,” 10 October 2010, Associated Press. 38Congressional Record, House, 111th Cong., 2nd sess. (17 June 2010): 11130; Congressional Record, House, 111th Cong., 2nd sess. (17 June 2010): E1141; Congressional Record, House, 111th Cong., 2nd sess. (10 August 2010): 1548; Congressional Record, House, 111th Cong., 2nd sess. (23 September 2010): 16487; Congressional Record, House, 111th Cong., 2nd sess. (29 September 2010): 17373. 39Congressional Record, House, 111th Cong., 2nd sess. (27 July 2010): 14097–14098; Congressional Record, House, 111th Cong., 2nd sess. (30 June 2010): 12411. 40Congressional Record, House, 111th Cong., 2nd sess. (30 November 2010): 18376. 41B. J. Reyes, “Candidates Talk Cash, Little Trash,” 14 October 2010, Honolulu Star-Advertiser: n.p. ; B. J. Reyes, “Djou, Hanabusa in Dead Heat,” 24 October 2010, Honolulu Star-Bulletin: n.p. ; B. J. Reyes, “Djou Holds Slim Lead in Congressional Race,” 25 October 2010, Honolulu Star-Advertiser: n.p. 42“Djou, Hanabusa Raise Similar Amounts in September,” 18 October 2010, Associated Press; “Djou Doubles Foe’s Contributions in October,” 23 October 2010, Associated Press; B. J. Reyes, “Djou Promised Seat on House Appropriations Committee,” 12 October 2010, Honolulu Star-Advertiser: n.p. ; B. J. Reyes, “GOP Leader Promises Djou Key Money Post,” 13 October 2010, Honolulu Star- Advertiser: n.p. 43“Send Hanabusa to Serve in D.C.,” 21 October 2010, Honolulu Star-Advertiser: n.p. 44B. J. Reyes, “Djou, Hanabusa Invest Shoe Leather,” 30 October 2010, Honolulu Star-Advertiser: n.p. ; B. J. Reyes, “Hanabusa Tops Djou for House Seat,” 2 November 2010, Honolulu Star-Advertiser: n.p. 45Congressional Record, House, 111th Cong., 2nd sess. (21 December 2010): 23238. 46“Djou, Carlisle to Face Caldwell in Honolulu Mayoral Race,” 8 June 2016, Associated Press; “Rail Takes Center Stage in Honolulu Mayoral Race,” 27 July 2016, Associated Press; “Honolulu Mayor Race Heads to Runoff Election,” 14 August 2016, Associated Press; Gordon Y. K. Pang, “Caldwell Beats Djou to Win Reelection as Honolulu’s Mayor,” 8 November 2016, Honolulu Star-Advertiser, http://www.staradvertiser.com/2016/11/08/breaking-news/caldwell-leads-challenger-djou-in-early-results/ (accessed 1 June 2017). "Charles Djou" in Asian and Pacific Islander Americans in Congress, 1900-2017. Prepared under the direction of the Committee on House Administration by the Office of the Historian and the Office of the Clerk, U.S. House of Representatives. Washington: Government Publishing Office, 2018.